Did your son or daughter lose a baby tooth months ago and there is still no sign of a replacement tooth? Here are two common reasons (and three rare ones) why this sometimes happens. First, for a permanent tooth to erupt into place, there must be sufficient space. The permanent teeth in the front of the mouth are much wider than the baby teeth they replace. Ideally, by the time a baby tooth is lost, there should be extra space on either side of it so that the permanent tooth will have plenty of room. If there is not enough space however, the permanent one won’t come in. This is surprising to parents whose child’s teeth “looked perfect” before the baby one fell out. But baby teeth shouldn’t look perfect by age six; there should be spaces between all the front ones. If there is insufficient space when the baby teeth are lost, your child may need orthodontic treatment to help the permanent teeth erupt. Second, when a permanent tooth does not come in after a baby tooth has been lost, it may be because the tooth underneath is heading in the wrong direction. There are times when a permanent tooth just doesn’t follow its baby tooth and erupt correctly. This is very common with upper canines and lower second bicuspids. Even when there is enough space (which is almost always the case in the lower arch), the permanent teeth can veer off course and end up in the wrong place. In many cases, removing a baby tooth as soon as the problem is identified may help correct the path of eruption. If the path doesn’t change however, orthodontic treatment is usually required to rescue the wandering tooth and guide it into the right position. While crowding and crooked eruption paths are the most common reasons why permanent teeth don’t come in on time, there are three rare conditions that must also be considered. First, it is possible that the permanent tooth that corresponds to the lost one just never developed. 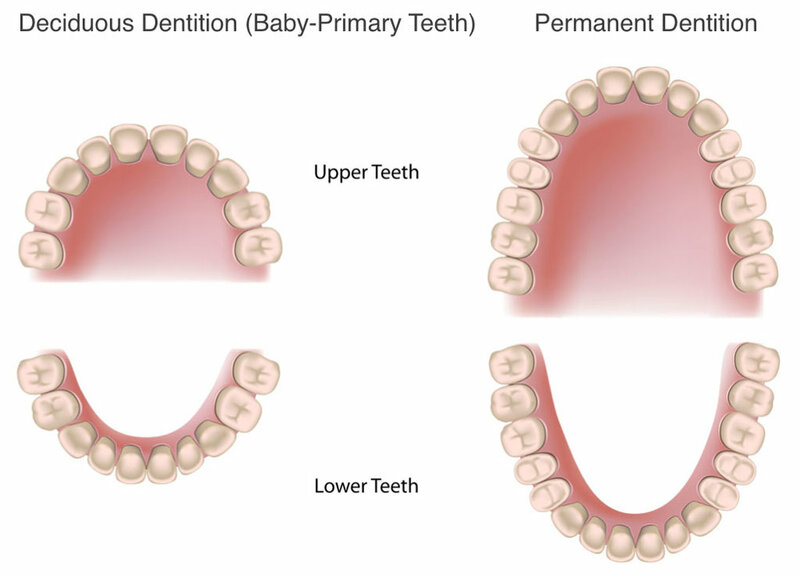 In cases of missing permanent teeth, most baby teeth do not get loose on their own. Sometimes however, they are lost and there is nothing to replace them. Second, there is a rare condition called primary failure of eruption in which the permanent teeth are present, they just don’t come in on their own. In these cases, braces and oral surgery are required to rescue them. This condition usually affects multiple teeth and treatment times may be three or more years. Lastly, there is a condition called ankylosis where the teeth are fused to the bone and won’t erupt. Although it is sometimes possible to “wiggle” them loose during a surgical procedure, there are many times when these teeth just cannot be moved and must either be left where they are or removed. If your child lost a baby tooth and no replacement one has come in, you should have him or her evaluated by an orthodontist. An orthodontist is a dental specialist who has two to three additional years of training after dental school in diagnosing and treating problems related to development. Even if there is nothing wrong, it is good to have the peace of mind that comes with knowing that everything is normal.